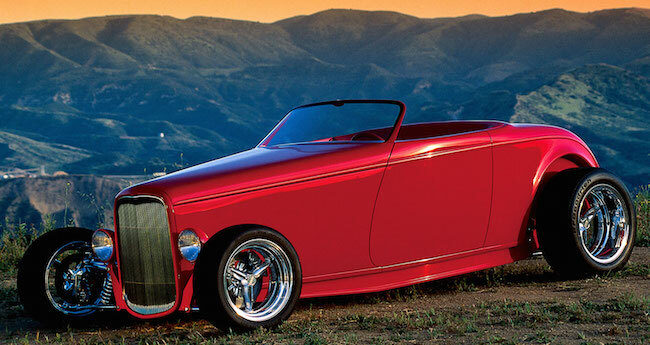 The Boydster 1 roadster rolled into the hobbyDB Boyd Coddington online musem at hobbyDB this week. 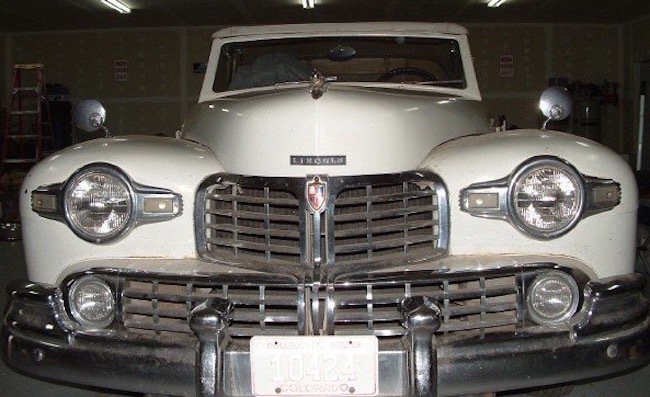 The original Boydster was built as Coddington’s own personal ride, the first he had done for himself in years. This ’32 Ford harkens back to the clean, simple look of early hot rods, fenderless and absent most chrome. The hi-boy style retains the proportions of the original car, but the entire body was actually reconstructed from aluminum. Attention to detail includes having the leading edge of the doors run right into the raked windshield. The custom red color is perfectly matched in the leather upholstery, carpets and steering wheel. You can read much more about it here. Our collection is organized and maintained by Boyd Coddington Jr., son of the late great customizer. We will add a new entry every week or so… not just the real cars, but also the miniature versions in diecast, kit, or whatever form they take. You can get the full story here. The Boydster 2 was also added to the collection recently. As much as we want to claim to be the experts on his full-sized cars, though, we still need some help completing the rest of our collection. Got a model of one of our cars that we haven’t listed? Did you score some sweet promotional materials at a car show? Got any amazing photos of his rides in action? You can log onto hobbyDB and post them! We’ve been awfully busy at hobbyDB, creating homes for even more collectibles.. 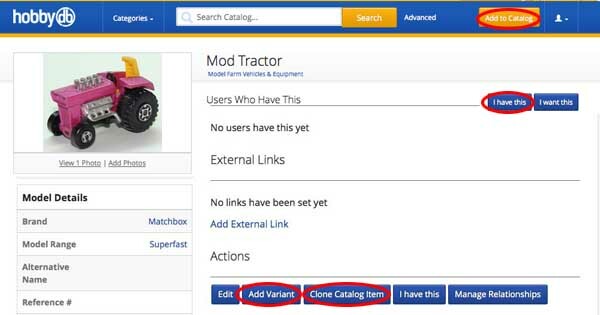 In the past week, we added Catalog Item Types for Marbles, Matchbooks, and Slot Cars among other things. These new sections will allow a larger population of collectors to add to our catalog, manage their collections, and buy and sell items of interest. Other new types include Gaming Cards, Lunchboxes, Track, Action Figures, and Comic Books & Graphic Novels. So if you collect any of these, now you can enjoy our website even more! Help! Our Coffee Maker Looks Like Darth Vader! Darth Vader probably likes his coffee black, right? 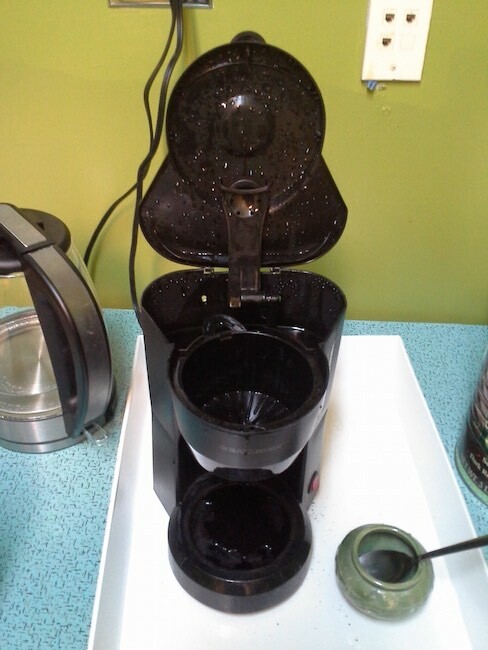 We just noticed that our office coffee maker looks like Darth Vader when it’s open. So let’s have a contest… Use your Photoshop skills to make this photo even cooler, and post it in the comments on our Facebook page. Best image wins a $10 shopping credit on the hobbyDB website! Entires must be in by 11:59 pm Wednesday, May 20, 2015! CONTEST IS OVER! hobbyDB is glad to have Casey Thornton on board as a Catalog Editor and Outreach Specialist. His job entails reaching out to collector clubs to round up experts and participants for our project. Casey worked previously as the Multi-Unit Manager for Human Touch and as a Genius at the Apple Store, which really comes in handy in our Mac-based office. 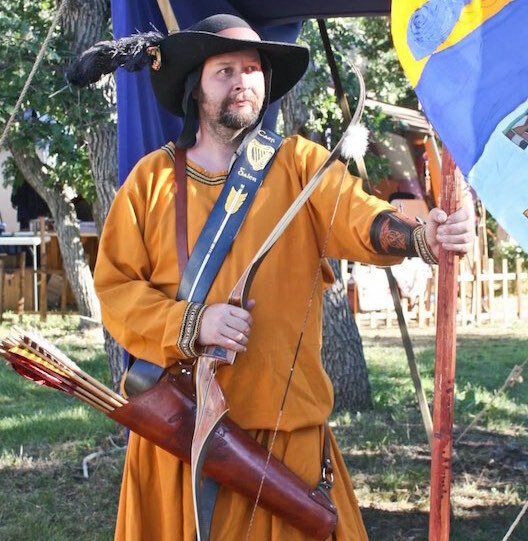 He collects Bows and Archery related items, as well as Books and Medieval related items. His more modern passions include restoring a 1948 Lincoln Continental Cabriolet that has been in his family since it was brand new. He is also the Subject Manager for the Lincoln section on our site. New to hobbyDB? Here’s our quick start guide! 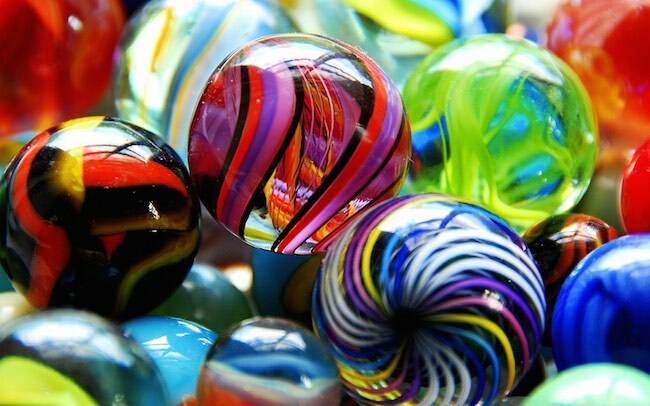 Finding collectible items is easy on our site. Just go to the search window at the top of any page and punch in a few words! You can now browse our huge database of collectibles. Our search function is easy to use. And you can do a lot more at our site when you create an account. You can do a lot more than just look… Start by logging into your account (or create one if you haven’t yet… it’s fast and free!). 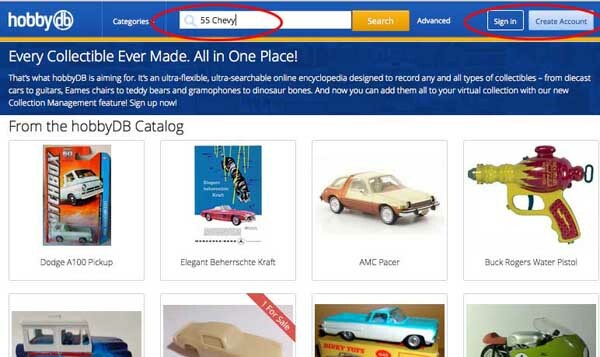 Now you can add items to our catalog by clicking the Add To Catalog button. Or you can add variations (such as a different color or different wheels) to an already listed model with the Create Variant button. Every item you add helps us fill up our fast growing database! There are several ways to add an item to our catalog if it’s not already there. You use hobbyDB to keep track of your collection… Mark items that you have in your collection by hitting the I Have This button when you see it on our site. And if you want to let the world know you are looking for one, you can hit I Want This. We also have a marketplace for collectibles at hobbyDB. Look here for a quick guide to buying or selling collectibles.You’ll be up and running in no time!